After co-organising and helping out at a few races over the last few years, this year I decided to take the next step in my involvement with the sport and train as a British Cycling Road Commissaire. I heard through Maryka that there was a course early in the year, so after some mild pestering of Eric Lejeune I managed to book a place and spent a day in a village hall in Surrey learning the ropes from the local British Cycling team. After that, you need to do at least 6 races as an assistant commissaire, and so this year I have been fulfilling that role about once a month, as well as sitting in with National-level commissaires and being lead driver in a race, so as to get experience of all the roles involved. I have to say, being assistant comm is great fun – you get the best seat in the house at any race, spending your time at the front of the bunch, tucking in behind any breaks that form and ultimately watching the race leaders fight it out on the last lap. I thoroughly recommend getting involved to anyone else. I had intended to have a go at the Dunsfold veterans series to get some Surrey League points for the club, as well as my local handicap races at Kitsmead Lane. Unfortunately I couldn’t quite get my fitness together for most of the season after severely bruising a rib when I fell downstairs just before going on holiday – that led to over a month off the bike in April and May, which isn’t the best preparation for the season. I ended up dropping out in the last lap at Kitsmead, and finishing the Dunsfold race that I did having just been lapped by the leaders (see pic). 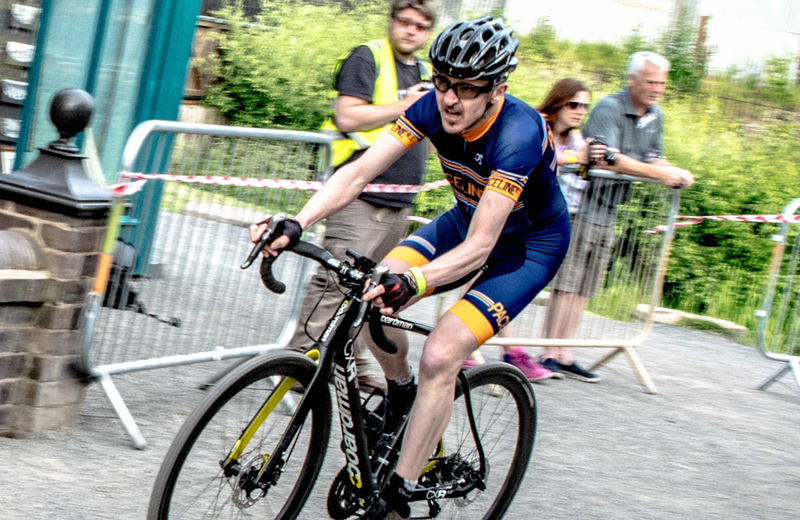 I got a cyclocross bike last winter to do most of my training on (disc brakes and Di2 gears make it a pleasure to do the miles) and I decided to use it for its intended purpose by entering the crazy Queen Victoria Cyclocross race over the summer (see pic). I trained a bit and did some skills drills to practice mounting and dismounting, then drove for several hours to the midlands for the evening race which took place in a working Victorian industrial town. The circuit was brilliant, going through the woods, up a long set of steps, and then weaving down into the town and going around all the buildings and past the fairground – which provided a fantastic atmosphere. I managed to start on the front row through sheer luck, and was plugging away in the top third of the field when I hit a rock on the second lap and got a pinch flat. That was my race over. After the disaster at the Queen Victoria I learned that clinchers are not a good choice for cyclocross. I didn’t want to splash out for a new set of tubular wheels and tyres, so that left tubeless as the only option. Using my existing Mavic Aksium wheels, Contintental CX King tyres and a “Joes No-Flats” conversion kit I went through a dozen CO2 canisters and a puddle of sealant on the dining room floor before I discovered the secret: clean the inside of the tyres, paint on a layer of liquid latex and then let it dry. After doing that, I now have a reliable tubeless CX setup that lets me run as low as 20psi with no punctures or burps. This winter I have entered the London Cyclocross League, and three events in I am hugely enjoying it. The racing is intense, but there is a lot of skill involved as well as fitness and because the field spreads out during the first lap you never get dropped – you’re just competing against the riders who are at about your pace, so there’s always something to be thinking about. It’s really social too – plenty of time to meet and chat to people while warming up beforehand, and each event has races for all categories, from 10-year old kids up to 50+ veterans, of all genders. It’s becoming my favourite form of racing.